The leading resistance of Leyla Guven is a great sample of heroism and strong will of our freedom movement in practice. It is aligned with the spirit of Newroz. The military defeat of ISIS has demonstrated the strong will and power of free Kurdish nation to the world. We will celebrate Newroz and those achievements. Our freedom-seeking nation is struggling for freedom and honor and will not accept occupation and slavery. With these promises, we move towards the New Year. An incredible will has formed among our nation, a phenomenon that occupying forces attempted to eliminate for years. Capitalism and retrogressive corruption tried to divert revolution and struggle in Kurdistan and at the same time promoted and normalized frustration and submission among people. It is vital to understand and analyze the circumstances at this age. This era is the formation of a new system to manage society and is an excellent opportunity for our nation to achieve its goals. There is a free election ahead of us, whether to continue the slavery of the past century with classic politics or choose a free life with the paradigm of a free society in the future. 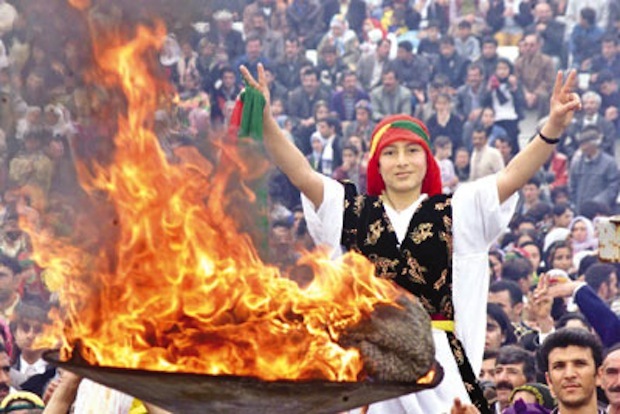 Newroz is the beginning of spring where winter’s frost comes to an end. A new season is going to start, it brings a promising heat of the fire and Newroz. The flames of Newroz’s fire must turn into hell for occupiers, retrogressive forces, and traitor mercenaries. This year’s Newroz must become the Newroz of resistance and victory. Newroz of Kawa’s uprising for freedom and destroying the fascism and chauvinism governance system. For this stage, devotion and revolutionary morale must reach to the peak and push occupiers back in all fronts. despite all the problems faced by our nation, they chose the struggle for freedom with the understanding of this historical opportunity. It is important that our nation moves forward towards freedom with unity and ridding their minds from slavery and submission. Occupiers of Kurdistan and their hirelings are using every possible conspiracy to deceive and terrorize the society, but the politics of the era and the situation is different from the past. The era of one nation, one flag, and one country are over and freedom-seeking nations will demolish this system. Consequently, the victory belongs to Iran’s freedom-seeking people and our nation. Every free Kurd must choose her or his own path by becoming a part of the struggle and no longer accepting the occupation of their homeland. Happy Newroz to martyrs and their families and all fighters and freedom seekers. We renew our promise to turn Newroz into upraising and struggle to achieve freedom and equality and an honorable life for our nation in Kurdistan.